Definition of a good movie? One that makes you laugh and cry. At least for me. This is probably one of the most underrated comedy/love stories of all time. Directed by the very funny Bonnie Hunt – this story will move you and have you laughing all the way through. Great supporting cast including Jim Belushi, Carroll O’Connor and Bonnie Hunt – it has many surprises and delightful moments that make this movie a classic and one you will want to keep in your library to pull out and watch over and over. 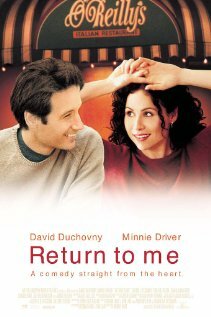 Grace, played by Minnie Driver has a heart transplant, only possible because a woman dies in a car accident, the wife of Bob – a builder and architect, played by David Duchovny. The two of them meet one year later at the Italian restaurant that belongs to Grace’s grandfather and friend, Angelo. After their chance meeting they begin to date and fall in love – never suspecting that her new heart once belonged to Bob’s wife. The scenes with the older men playing poker and listening to old Frank Sinatra and Dean Martin records are PRICELESS! And I LOVE every scene with Jim Belushi – who plays Bonnie Hunt’s husband. If you have never seen this little gem – you need to see it! Below is the trailer from the movie – Enjoy! Greg and I were having a conversation last night on the subject of “works” and how it plays into our Christian life. Yes – one of those somewhat deep and controversial subjects on the passage from the first part of Romans 8 – where the author is talking about living under the “law” – and the “flesh” versus the “spirit”. We were trying to wrap our minds around the concept of the highly disputed area of scripture – if Jesus died to save us – is there anything we can do to “lose our salvation”? If salvation is a free gift – why does there seem to be some dialogue about “doing something” and not just “being saved”. It is a debated issue – in the baptist church and maybe some others as well – I know. I used to date a good old baptist boy in high school. He knew his scripture alright – he just didn’t seem to have the context correct half the time. But I know in our movement (Assemblies of God) – we do not hold to “eternal security” – and we do believe that you can “lose out” with God – by denying Him and by deliberately disobeying Him and turning down a path of wrong choices. As we were discussing this subject last night – I kept coming back to the scripture above from Ephesians – about grace. Not of “works” so nobody can boast about their own achievement. We cannot “save” ourselves. It is a free gift – which is offered to all of us – no matter what we may have done so bad. There is no sin that was not covered by the blood when Jesus died 2000 years ago. It is a matter of just – accepting the gift. You can’t earn it – you can’t pay for it – you can’t just “lose” it either – unless it is a “willful” and “deliberate” action on your part to turn away and deny Christ altogether. 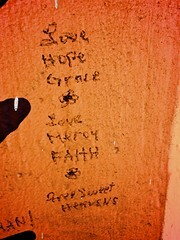 When I think about grace – I am reminded of Mary Magdeline. She was a woman who had much sin in her life. She was in a lifestyle involving prostitution. She was beyond just “crossing the line” with men – she was living it. When Jesus forgave her – her life was dramatically changed and she followed Him. She experienced the love, forgiveness and grace of our Lord in such a personal way – when she deserved to be stoned for her many crimes. Paul is another example of a man totally and radically changed by the power of Jesus in his life. He had been a murderer of Christians and full of self righteous pride. When God poured His grace out on Paul – he was a changed man and our first missionary who wrote more than half of the New Testament. You think you’ve gone too far? Sinned too much? God can’t possibly save you – forgive you – pour His grace out on you? Think again. All you have to do is reach out and accept it – the rest is the work of the Holy Spirit in your life – changing you and remaking your desires and cleaning you up on the inside. That’s grace. There is NO WAY you can do that on your own! If anyone thinks they can – they are full of pride and denying that they need a Saviour. Do we have to “work” or just “be”? That is the highly debated question. Some would say – we do nothing. It is God’s free gift of grace. Others would say – yes that’s true – but….you can’t live anyway you want to either. We have to live lives pleasing to God – examples of His life inside of us – so that the world may know and see something different and even contageous about us. I just know that when we are “filled up” with the grace and forgiveness of God in our lives – everything is different for us. We no longer want to live lives that are displeasing to God. It doesn’t mean that we won’t have temptation in our lives. It doesn’t mean we won’t blow it – and even have sin in our lives at times. It doesn’t mean we won’t encounter difficulties, painful choices, health issues, family trouble, loss of friendships etc. But it does mean that we have the Holy Spirit living inside of us to comfort, help and guide us – and give us that deep joy – found only in living a life that our creator intended for us. And His grace is new every morning. You just have to reach out and take it. I am praying for you – that if you have not already done so – that you will accept this free gift of grace – and find that joy and happiness for yourself.